Found one file extension association related to TimeCalc Classic and 1 file format developed specifically for use with TimeCalc Classic. 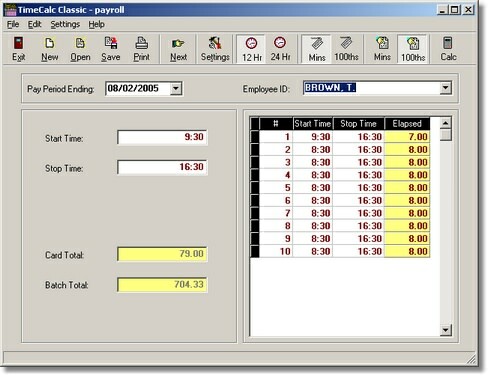 TimeCalc Classic, the Time Card Calculator is a popular calculator program used for totaling payroll time cards and time sheets. Anyone who has had the job of totaling employee time knows what a time-consuming and tedious process it is. TimeCalc Classic is a specialized form of calculator that helps you get through this job quickly, with total accuracy. If you need more information please contact the developers of TimeCalc Classic (ProSystems, Inc.), or check out their product website.